One of the hardest aspects of the boxing world outside of the ring is putting on shows at the "club" level of the pro ranks, and an amateur club show. Anyone who has attended an amateur show knows that going to one of these shows is like going to an afternoon at the horse races in that their is a good chance a fighter will be a late from the card for reasons beyond the promoters control. 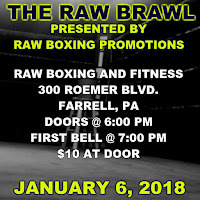 The past few months, Cliff Gregory of RAW Boxing and Fitness located in Farrell, Pennsylvania has had a string of bad luck which has forced him to push the date of his Raw Brawl on two occasions. 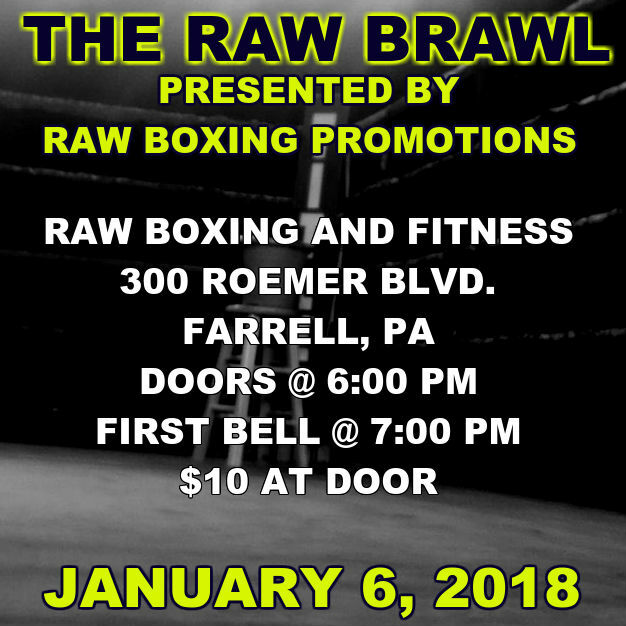 The newest date for the Raw Brawl has now been set for January, 6 and appears to be the first fights of 2018 that I will get a chance to cover for Youngstown Boxing News. Admission for the fights which are being held at RAW Boxing and Fitness located at 300 Roemer Blvd in Farrell will be $10 with tickets being sold at the door. First bell for what promises to be a great night of amateur boxing is at 7:00 PM with the doors opening at 6:00 PM.